My birthday is today. I am 51. I remember my father's 51st birthday. It is the first birthday of his that I remember. I was seven. The previous summer we had moved to Butte, Montana from Winthrop, Washington. My father decided that seven years of cattle ranching was about enough fun and returned to teaching. He taught Chemistry at Montana Tech in Butte until his retirement. On his 51st birthday, my mom made him a cake. It had five big candles and one little candle. I remember this so clearly. She counted them off: "Ten, Twenty, Thirty, Forty, Fifty, and one." Blowing out 51 candles would have been vulgar. Once you hit fifty you start counting in decades. Longevity is in the genes. 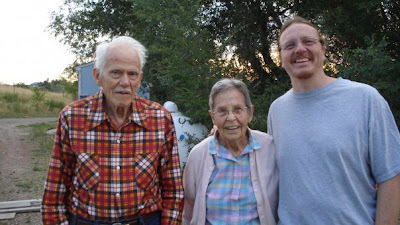 I celebrated with my father his 94th birthday this summer on June 6th. I can't remember if we had a cake for him or not. If we did I am sure we used those candles that are shaped liked numbers, 9 and 4. Funny, I really don't remember if we had candles for him or not. After 94 birthdays he may have graduated from having to blow out candles. Just give him his favorite, pecan pie, already. My father has had a lot of birthdays. I haven't been there for all of them but for a good number of them. I am lucky that way. I have to remember that today. Because it is going to be a sad day. Zach won't be at his old man's 51st birthday, let alone his old man's 94th should that unlikely event occur. It is those little things like memories of birthday candles that come out of nowhere and heat up that burning hole in the chest. Here are a couple of photos I just found in my Facebook collection. Here are my parents and me from three years ago in Montana. 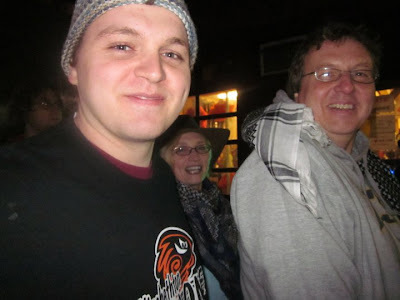 Zach and I (and Lovely in the background) waiting outside Grimaldi's in Brooklyn, NY on Thanksgiving 2010. That was a good trip. Birthdays still happen until they don't. As impossible as it seems, we still have memories to make. One foot in front of the other. When confronted with earth shaking loss, I've found it a helpful thought to try and find things -- even the tiniest of things such as joy in a roadside flower -- to embrace in my present, all the while treasuring, honoring, and holding dear every drop of my past and my precious memories of my loved one. Happy Birthday to you! Mine was yesterday. Ain't sayin' which one, but it's at least a decade more than you . . . I know you will have a bitter-sweet day. Virgos rule. Keep blogging. Best wishes on your natal anniversary. You have many friends and supporters, and quite a number of folks like me, who have only met you in the aether, but care for you deeply and wish you well. @Sea Happy back at ya!